Blonde Sister has always lived within ten miles of me. Just two years older, she is part of every childhood memory I have. On the first day of kindergarten, Blonde Sister walked me to my classroom and delivered me, scared and shy, to the teacher. The summer after eighth grade, she went with me to my first dance. The night before I began high school, she drew me a map of the school and said, “So long as you remember where the auditorium is, you can’t get lost.” Almost everything I've ever done, she did first, and that has made my life so much easier. One of my earliest memories involves an Easter egg hunt at a neighbor’s house down the road. The older kids were running around, finding eggs. I kept chasing after them and looking in the same spots, which was not at all effective. I said to Blonde Sister, in despair, “I can’t find an egg.” She was five years old at the time. She took a bright green egg from her basket, walked a few feet, and set it on a wooden railing. I ran over, grabbed it happily, and then ran to brag to everyone that I’d found an egg. We fought sometimes as kids because that's what kids do. The year she turned ten years old, she would say smugly “I’m double figures,” just because it made us younger siblings mad. And when she played Monopoly, she just HAD to put hotels on those light blue properties. Every. Single. Time. When we played the game Twenty Questions around the campfire and the rest of us were methodically asking questions to narrow down the search, she’d shout out things like, “Is it the Statue of Liberty?” in hopes of winning the game with one guess. Blonde Sister was an eternal optimist. On our vacations at camp, we’d all be standing around gloomily on a dark rainy day, and she’d point across the river and say, “I see a patch of blue sky coming this way.” She was very artistic – whether we were painting the picture windows for Christmas or making travel kits for our annual trip to visit my grandmother and Aunt Seashell – her colorful drawings made my stick figures look a bit pathetic. I still have the colorful mural she painted for my daughter when she was a baby. For many years, I saw my sister every day. I’d drop my kids off at her house on my way to work and I’ll pick them up on my way home. That’s why my four kids were so close to her. She helped raise them. In the summer, she’d call and say, “Let’s do a Kid Switch.” I’d drop Shaggy Hair Boy at her house to play with Blonde Niece, and take her older two daughters home to play with my kids. The seven kids, mine and hers, have always seemed more like siblings than cousins: they still hang out together, all the time. My oldest sister was a private person who never liked the spotlight. Three months ago, when she was diagnosed with an aggressive form of breast cancer, I respected her privacy, as well as the privacy of her husband and three daughters, and I didn’t write anything about her struggles on this blog. I didn't write about her weeks in the hospital or what it must be like for my parents, who are in their 80s, to see their oldest child so ill.
Blonde Sister died last Sunday. She was 55. I still can’t believe she’s gone. I keep wanting to pick up the phone to call her. All week, the family has been gathering at my house, to talk and grieve and eat food, and I keep expecting her to walk through the door. I am still in shock. It’s taken me a week to write this blog post. Writing is what makes things real to me. And this is something I don’t want to be real. This photo of Blonde Sister taken in the early years of my blog. 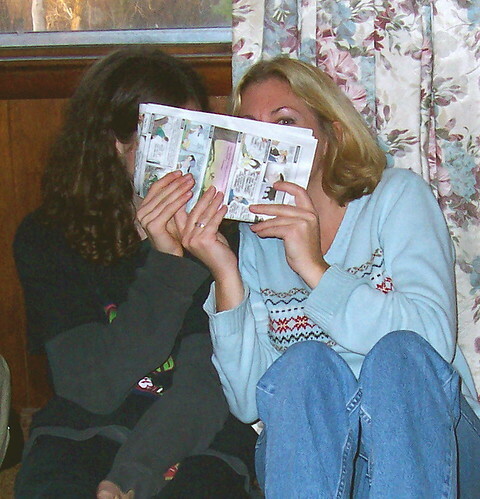 She and my son Shaggy Hair Boy were joking about how I never show faces on my blog, so they were hiding behind the newspaper and saying, "Go ahead! Take a photo for the blog!" I am so sorry to hear this news. What a loving tribute. I'm so sorry, jo(e). You wrote this beautifully, and my heart aches for you and your family. I feel like I know your family from years of reading your blog. What a loss. Breast cancer is a terrible disease. I am so sorry for your loss. Sending my thoughts to you and your family. Oh Jo(e) I'm so sorry... Sending lots of love to you and your family. This is a wonderful tribute jo(e). Its integral to write these memories down, although it creates a deafening realism it helps to combat the fleeting sense of memories, they can seem like their hovering - just beyond reach and when you think you've caught it - it disappears. I still find myself going to call my dad, even though its been 2yrs now and remember sharply when I start to dial that there's no one on the other end of the line. Time fails to convey a linear sense afterwards, its like your riding a wave in the ocean, you just have to go with the ebb and flow. Thank you for sharing, although this seems in the least enough to say. </3 How absolutely heart wrenching. I know this feeling of wanting to pick up the phone - I lost a childhood friend and the first thing I wanted to do was call her to discuss it. I'm glad you have a family that is not letting you grieve alone, though I suspect at times that's what you'd like to do. Though we are all dying every day and though we all may know it's inevitable, that knowledge and reality doesn't make it a single bit easier to lose someone permanently from our lives we planned to share our aging years with. It feels like a crime. I hope for it to get easier for you sooner than you expect it to. I was patiently waiting for this post and it's beautiful, well worth the wait. I'm so so sorry that this happened and is "real," as you say. The saddest reality ever. Ever since I heard the news I've been constantly thinking of you and your family, since over the years we --your readers and friends on the computer -- have come to know and love all of your family. Jo(e), I was so sorry to read of the loss of your beloved sister. Thinking of you and your family. I'm so sorry for your loss, Jo(e). You have written a beautiful remembrance. Take good care. I'm so sorry - Cancer is so cruel. I hope the memories are shared freely and with love and some laughter amongst your family. Cancer took my mom - we had about 6 months, but since it was brain cancer she wasn't herself for most of it. She lives in the stories we tell. I know your sister will too because you are a great storyteller. Your sister sounds like an amazing person, and your tribute to hear is absolutely beautiful. I am so sorry for your loss. Keeping you and your family in my thoughts. As Tom said, it feels as though your long-time readers practically know your family from your blog, which makes this post even sadder than it would have been otherwise. I'm so, so sorry for your loss, jo(e). As a long time reader I had been wondering and worrying about you over the fall. My heart goes out to you and to your family. I'm so sorry for all of you. As the Quakers say I will be holding you in the light. May the circle be unbroken. Oh jo(e), I am so sorry for your loss. I'm so sorry jo(e). May she live on in your memories. I am so very sorry. I am holding you and your family in the light. I am so very sorry. Beautiful tribute. She was so young! I feel like I know her from reading your blog over the years. I am so sorry. I'm so sorry. She sounds like a wonderful sister. I am so sorry, jo(e) -- may there be more memories of joy arising from amid the tears and grief. Oh J, I am so incredibly sorry. I have no words for you but I do have prayers and hugs and I am sending those. Please feel them and know that I am laying a candle at our mother's feet. I am so glad you had such a wonderful big sister. Sending condolences on the loss of your beloved sister. I'm so, so sorry for you and your whole family. She sounds lovely. I am so sorry to hear this. She sounds lovely. I am sobbing for you and for your sister who I've never met except through your blog. Sending hugs and all the love in the world to you and your family. What sad news. I'm so sorry for your whole family, she sounds like a simply lovely person and the kind of sister everyone would wish to have. Strength and comfort to you all. My thoughts are with you, Jo(e). I have been reading your blog for several years, but have never commented. I'm so very sorry for your terrible loss. I am so sorry, Jo(e). It's heartbreaking. What a terrible loss for all involved. I'm very sorry. This is a touching tribute to your sister. I am sorry for your sudden loss... and still you had the energy to play #TvsZ. I experimented with writing a blog post to process the death of my father last January. I was surprised how much it helped me and the comments I received were an unexpected gift that helped me even more. May healing energy flow to soothe your grieving heart. I, too, am so sorry for your loss. Thank you for sharing your sister with us in this post. And, because in times like this I always fall back on the comfort of simple, repeated word, let me add: May her memory be a blessing to you and yours. Oh, Jo(e). I'm so sorry for your loss. This is a beautiful tribute to her, and I know it must barely scratch the surface. My thoughts are with you and your family. I am so sorry for you loss. You and you whanau are in my thoughts. Kia kaha. This is both beautiful and heartbreaking. I read it yesterday but didn't have time to comment, and it hits just as hard re-reading it today. I'm so sorry for your loss. I have to believe that Blonde Sister is still walking through your door...or, more accurately, she's always been (and will always be) right there with you. What a tremendous loss to your whole family. I read your blog from my spot in the world overseas and only seldom make comments. (English is not my native language.) But now I have to thank you for sharing your memories of your sister with us. My understanding of life is put together of all that we remember, keep in our minds and share with others. We may carry that individual life a short time, but together with all living things we keep Life going on, from long before till long after our imagination. These autumn days I´m keeping and sharing the memories of my wife, who died in late November seven years ago. I'm heartbroken for you, Jo(e). My sister and I share a similar close relationship. This must be devastating for you. My thoughts and prayers go out to you and your family. Sending hugs across the continent to you as you mourn the loss of your beautiful Blonde Sister. So sorry to hear your news, and to understand why your blog has been quieter of late - I hoped it was the good kind of busy, and am very sorry that it wasn't. I so love your blog, and I am so sorry for your your sister's passing and the huge loss it represents. The hole it leaves is as big as the love you have. So sorry for your loss. There aren't words I can write that will lessen this pain and sorrow for you. But know you have a large community giving you a virtual hug! I'm so very sorry, Jo(e). My deepest sympathies and condolences to you and all who loved your beautiful sister. I can't imagine the heartbreak of such a loss. May her memory be for a blessing. Oh, Joe. I am so sorry. I send love and warm hugs from the universe. Dear Jo(e) I am so sorry to read this. May you and your family find comfort in your memories and in each other. Oh, no. Oh, jo(e), I'm so sorry. I send you and your family as much love and comfort as you can possibly feel right now. You should have had each other for Monopoly games and visits into your nineties. I'm so sorry. I was wondering if you would be able to write about this. Although your blog is public, you always write about things that are so private, so intimate that it makes everything on your blog so much more real. This is real. It is hard. One day I will lose another person I love. It is scary. When you lost your sister, you lost so much more than just one person. Despite you being my professor, I do think of you often and know that slowly you will get through this. In the end there is no choice. Her body is gone but her spirit is with you. She will carry on with you. Stand tall. Thank you for sharing this part of your sister with us. I'm so sad for you and your family. I pray you comfort. I feel like I know your sister from all these years of reading your blog. Hugs from here. So sorry for your loss. How very difficult.